Creating A Custom ePaper Display FeatherWing #Feather #FeatherWing #ePaper #Adafruit @Adafruit @cogliano « Adafruit Industries – Makers, hackers, artists, designers and engineers! Dan the Geek writes on his blog about his work with the Adafruit Feather HUZZAH (ESP8266) and HUZZAH 32 (ESP32) boards. 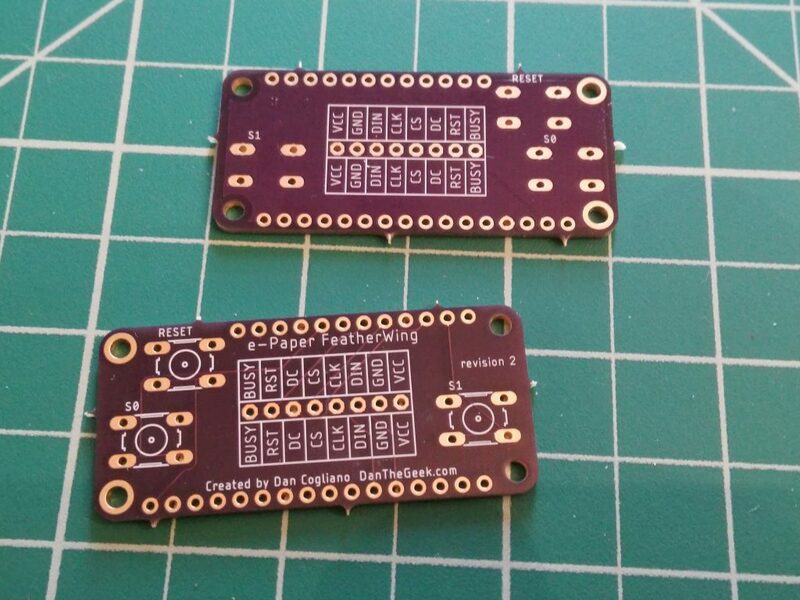 Dan has done some excellent work interfacing ePaper displays to these two boards and making things such as calendars, badges, and weather indicators. The initial problem I had is that the Waveshare displays require 8 wires to connect to the HUZZAH for the SPI interface and power pins. In addition, I wanted to add a reset button that will wake up the Feathers from their deep sleep as well as have one or two programmable buttons. This could have been done with a Proto Featherwing, which provides a mini-prototyping board for components, but the number of wires to solder for the e-paper display and buttons requires a lot of wires to solder in a small area. I decided to see if I could design a custom Featherwing that not only could handle the e-paper interface and the buttons but also be compatible with both the HUZZAH 8266 and HUZZAH 32. See the entire blog post for the process used to create this great add-on board.